Iran, July 12, 2018 - Following a recent decision by Iranian regime officials and transferring water from the Kazerun area (in southern Iran) to the city of Bushehr (also in Iran), regime operatives took action based on a court order to fill up the residents’ water wells in order to transfer more water to Bushehr. These measures, carried out on Thursday, are resulting in unrest and growing anger amongst the locals, launching a number of protest rallies throughout the day. Authorities dispatched the police and scenes of clashes erupted. Police units opened fire on the protesters, killing one man by the name of Iman Ahmadi. Reports indicate a number of individuals have been injured as a result of the gunfire and one of the individuals is reportedly in dire conditions. 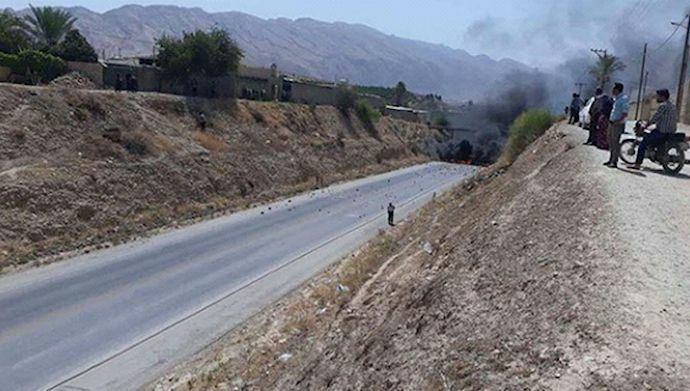 The state-run IRNA news agency covered these clashes and the death of one local by the regime’s repressive forces. Back in May, the city of Kazerun was the scene of major anti-government protests. This May 27thtake provides an understanding why authorities will be very careful to not spark protests in this flashpoint city. But unlike in the past, it doesn’t have the means to stifle the voices of protesters either. In Kazerun, not even the regime’s elite repressive forces were able to shut down the protests. On May 20, when the clashes peaked, the government dispatched backup forces from neighboring cities into Kazerun, but the people pushed them back. But in the course of the Kazerun protests, the Iranian regime quickly and overtly opened fire on the peaceful protesters because things were moving so fast that it feared the situation would spin out of its control. The use of lethal force was the manifestation of the regime’s weakness, not its strength. The Kazerun protests took place against the background of ongoing protests across the country. The Iranian regime is sinking deeper into a slew of economic and political crises inside and abroad. It has lost its main base of support in the West and is facing setbacks in the Syria, Iraq, and Yemen and across the Middle East. The regime’s problems have become exacerbated after the U.S. withdrawal from the nuclear deal and the U.S. Secretary of State’s declaration of a new tougher stance vis-à-vis the Iranian regime and its malign activities.